A new way of capturing the energy from the Sun could increase the power generated by solar panels tenfold, a team of American scientists has shown. 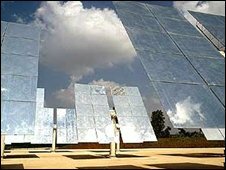 The new technique involves coating glass with a specific mixture of transparent dyes which redirect light to photovoltaic cells in the frame. The technology, outlined in the journal Science, could be used to convert glass buildings into vast energy plants. The technology could be in production within three years, the team said. "It makes sense to coat the side of [very tall] buildings with these new panes," Professor Marc Baldo, one of the researchers on the team, told BBC News. "It's not far fetched at all." The most advanced attempts to generate large amounts of electricity via the Sun require the use of a solar concentrator. These are often bulky mobile mirrors that work by tracking the progress of the Sun and concentrating its beams on the cell at its heart. But there are downsides to this technology: the cells at the centre have to be constantly cooled, and each concentrator requires a large amount of space to avoid shadowing its neighbour. The new technology does away with the need for mirrors and mobility. 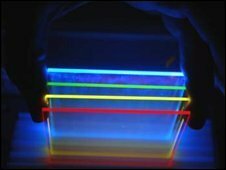 The Massachusetts Institute of Technology (MIT) team has found a way to coat panes of glass or plastic with a mixture of several dyes that essentially do the same job. "What we have is a piece of glass, with a very thin layer of paint or dye on top," explained Professor Baldo. "The light comes in and hits the dye and which absorbs it and re-emits the light, but now it's inside the glass so it bounces along there until it gets to the edge. So you only need to mount the solar cells around the edge." The idea was first developed in the 1970s but was abandoned because much of the light energy was lost en route to the cell. But using its expertise in optical techniques and a specific mixture of dyes, the MIT team has found a way to make the light travel much farther without losing as much energy along the way. "When you do this there is a little bit of energy loss with the dye," said Professor Baldo. "The main benefit is with the cost. You use a far smaller amount of solar cells. For the same area of solar cells, you get much more electricity." Existing solar installations could also benefit from the new concentrator, he said. "You could take this new kind of glass and put it on top of an existing solar cell so the cell still generates electricity but this glass pane with the dye on top captures a certain part of the spectrum and converts it more efficiently than the solar cell would do on its own." The MIT team believes it could improve existing panels by 50%. In addition, the system is simple to manufacture, requiring little more than to coat glass or plastic with the combination of dyes. It could be in production within three years, the researchers believe. If that becomes a reality, one obvious application, they said, was converting windows into energy plants. "The coated glass would let through about 10% of the Sun to light up the room, and the remainder would be captured and funnelled to the edges to solar cells to generate electricity," said Professor Baldo. "It would look like smoked glass because of the dyes." 2. High voltage solar cells on edge of glass capture sunlight. 3. Low voltage solar cells trap light escaping through first panel. 4. The first panel can also be used alone as a window pane. In the future, glass buildings could produce their own electrical energy.